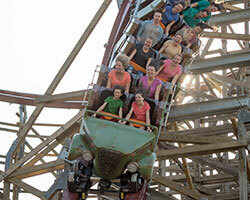 Wood and steel combine forces to bring you our newest roller coaster, Twisted Timbers. This one-of-a-kind hybrid coaster will send you twisting through an experience that is impossible on a traditional wooden coaster. 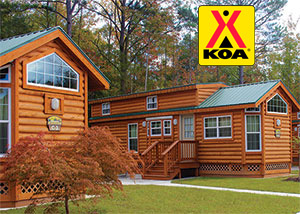 Located just steps away from Kings Dominion, Camp Wilderness - a KOA Campground - features camp sites, RV sites and a number of well-appointed deluxe cabins that are far from roughing it. 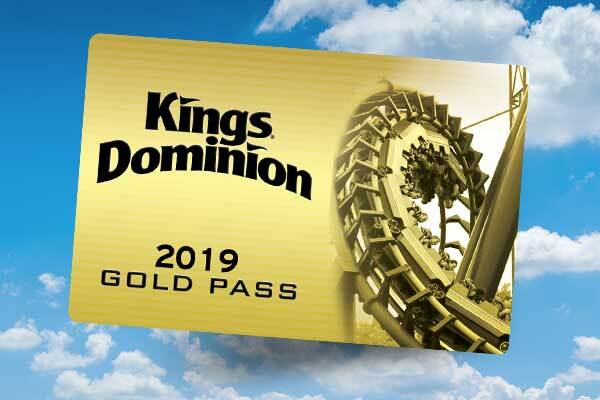 Get Unlimited Visits and Free Parking in 2019 to Kings Dominion, Soak City, Halloween Haunt, and WinterFest! Looking for a thrilling job? 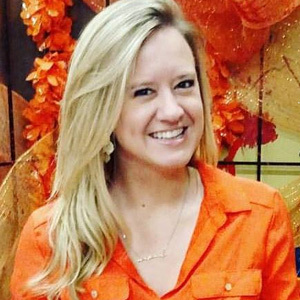 Want to earn cash while having fun too? 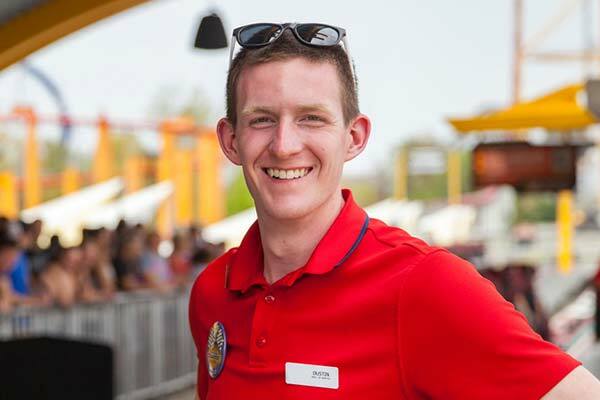 At Kings Dominion it’s more than just a job, it’s an adventure! Jobs are available in all departments from aquatics to rides, food to security and more. Apply online and let the journey begin! Happy February! It’s hard to believe that in a little over a month the front gates will open for our 2018 season and the midways will be filled with our awesome guests. As you know, the talented Rocky Mountain Construction team and our own great maintenance teams have been hard at work getting Twisted Timbers ready for riders. They are working on mechanical and electrical elements of the ride now, and soon we will begin running trains for testing. IT’S ALL HAPPENING! To get ready for the debut of such a unique coaster, we are excited to let you in on some other major changes happening in Candy Apple Grove. Get ready… there’s a BIG list! We are breathing new life into that area of the park, reenergizing a section that hasn’t had much change in over a decade. 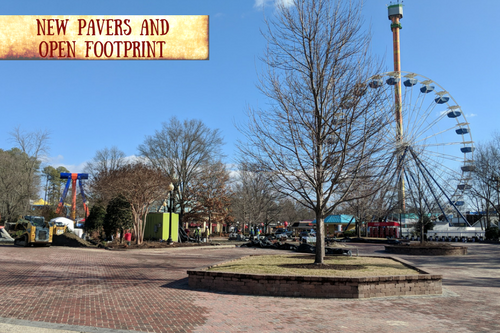 Some improvements include removing asphalt and replacing it with decorative pavers, completing a major renovation of the restrooms in the Grove and adding new lighting, seating and fresh paint to certain structures. The area will also feature a new festival plaza that we will utilize during our many signature events! As part of the revitalization, two of our fan favorite roller coasters, Ricochet and Rebel Yell are getting new names and signage! 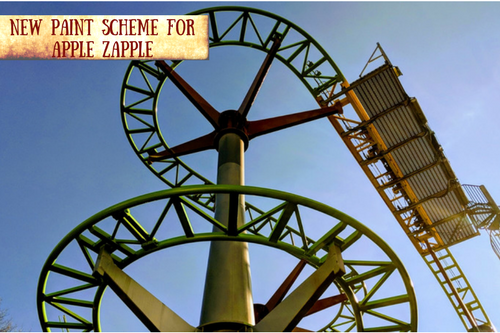 Ricochet will now be “Apple Zapple,” reflective of its tight turns and location in Candy Apple Grove. 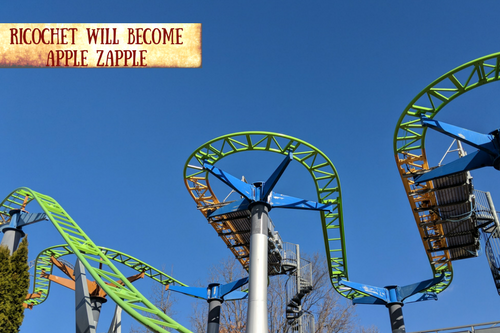 Apple Zapple is receiving a new paint job and color scheme. Rebel Yell will become “Racer 75” as a nod to its 1975 entry into the park as well as giving recognition to ACE, the American Coaster Enthusiasts, (rACEr 75 – get it?!). ACE was founded in 1978 after a roller-coaster-riding event on this attraction. The new name, Racer 75, is also reflective of the design, a racer-style coaster. 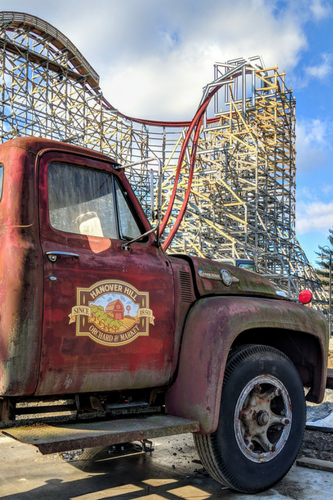 We will continue to replace sections of the track on this classic wooden coaster as a commitment to maintaining the iconic ride. As part of this work, riders will notice a smoother experience as they race through the course. 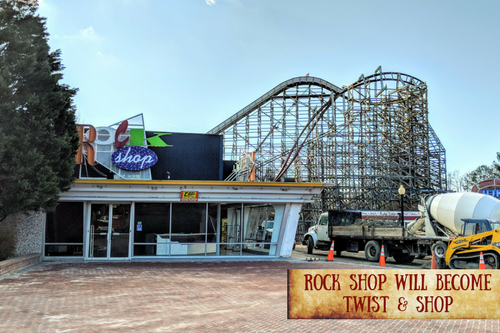 Rock Shop, the store adjacent to Apple Zapple and Twisted Timbers, is also getting a new name and face-lift. The shop will now be “Twist & Shop” and you guessed it, will sell all that awesome TT merchandise. AND…. drum-roll please…. 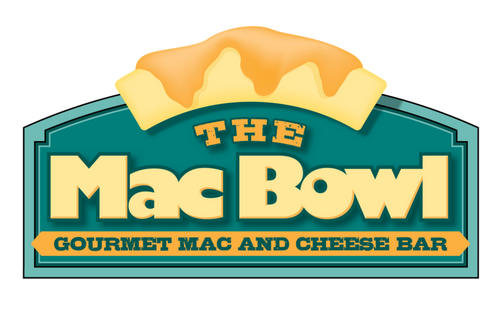 Dinner Bell is transforming into “The Mac Bowl” where guests can create their own gourmet mac-n-cheese bowls. YUM. 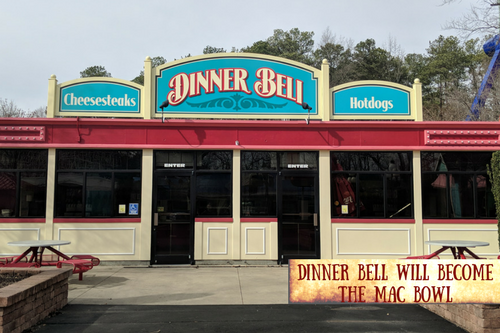 All of these upgrades will certainly revive this corner of Candy Apple Grove and we can’t wait for everyone to experience it opening weekend. 2018 is going to be one for the record books! 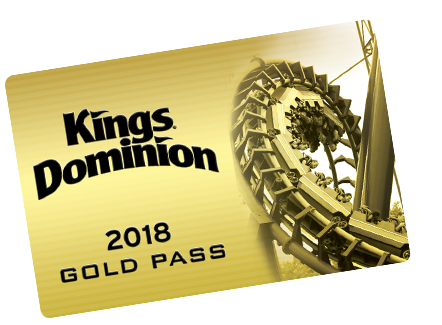 If you want to get a sneak peek of the action, make sure to get your Season Pass now so you can join us on March 23 for Passholder Preview Night!